...at least this one does, welcome to my blog! Sports betting has permeated the news again recently with new revelations in the Tim Donaghy case and with professional tennis. The Dan Patrick show asked yesterday why the NBA referee Donaghy betting scandal had been pushed under the rug so quickly. Why isn’t Arlen Specter looking into this? They even pointed out that the New England Patriots “Spygate” case has received far more press. It’s true. It is really quite amazing how quickly the NBA scandal went away from the main news. Here was a guy that fed every conspiracy theorist’s wildest dreams – the games really were fixed. Apparently, there are more games that could be in question due to new revelations according to the Pardon the Interruption radio show. Now that the playoffs are here, some questionable calls are certainly in the minds of fans as another possible scandal. Can you blame anyone now? How can the NBA refs be trusted? The truth is that Donaghy is facing a very steep prison sentence and hefty fine. In addition, he and his wife are publicly fighting over property and custody of their children. In addition, she has requested a restraining order be placed on him. A friend of the ex-ref and a professional gambler are also facing jail time in connection with the scandal. You really can’t blame the NBA for trying to bury and run away from this as quickly as possible to try and keep the integrity of the league. Perhaps all scandal should be dealt with in the same manner – find those who are guilty, punish, and move on. The problem lies in when there does not seem to be a punishment fitting the crime or when someone has a particular fancy for the events. Now professional tennis is having betting issues to mar its integrity. There are now 45 matches that are in question. An independent panel released a 66 page report (sound familiar?) about findings that examined about 73 matches in the last 5 years. A match with player Nikolay Davydenko started the entire investigation. A betting website brought attention to him when they seemed to have insider information about a particular match. Unfortunately, greed and trying to get a big payday for minimal effort is a part of life. These events do not only happen in sports, but wherever there is money to be made. With the internet and more coverage of everything, more indignities are brought to light. There is more scrutiny from more sources and more individuals crying foul at the first hint of impropriety. This is not an excuse, merely an observation. It is definitely a good thing that it is much harder to get away with these acts. Do you think there are a lot of refs out there who intentionally make bad calls just because they can get away with it? I guess I don't really think so, but I was just thinking about that as I read your post. It's probably just that a few refs make the others look bad. I think that most all of them take their position and the integrity of the position very seriously and do their best to overshadow the bad apples that give them a bad name. In fact, I'll try to find some happier stories of refs so that we can give them credit where it is due. Thanks for stopping by! Do you need a sport-related product reviewed? Want to collaborate? Do you have a press release, team, or event to promote? Would you like to have a featured link? Click on my profile and send me an email. 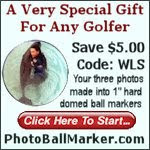 Click the image and save $5 on your very own set of Photo Ball Markers! They make a great gift! We All Get Excited About The Lakers! Every so often I will receive products to review at no charge. Unless I state otherwise, when I am reviewing a product you can just assume that I received it gratis from the company or publicist. I also use information from press releases - 99.9% of the time this is unpaid. There are links on this page that have been sponsored as well. A sponsored link is one that has been placed on here in exchange for merchandise or a fee. You'll find these under "Sponsored Links" or "Paying The Bills". Sometimes you will also find posts that are paid advertisements as well. These will be identified as "sponsored", "brought to you by", or maybe even "supported by". At times, I may show an ad for Photo Ball Marker. In the interest of full disclosure, I haven't received any money from them. However, they have been very cool about sending me many PBMs in the past and for different occasions. I am repaying their kindness by putting up their ad. In addition, my readers get a discount from them so why not click it and give a cool gift to someone (or yourself). 99.9% of the pictures and video that are used on this blog are readily available on the internet. Only a small portion have been taken by me or provided by a private party. Just assume that if an image or video appears here then you can probably find it somewhere on else on the Internet. I try to credit the source but I am in no way saying that these are my original pictures. If you have any questions or opinions about these practices just click on my profile and shoot me an email.